Wader Quest: Positive season for Black-tailed Godwit in the Netherlands and in the UK. Positive season for Black-tailed Godwit in the Netherlands and in the UK. 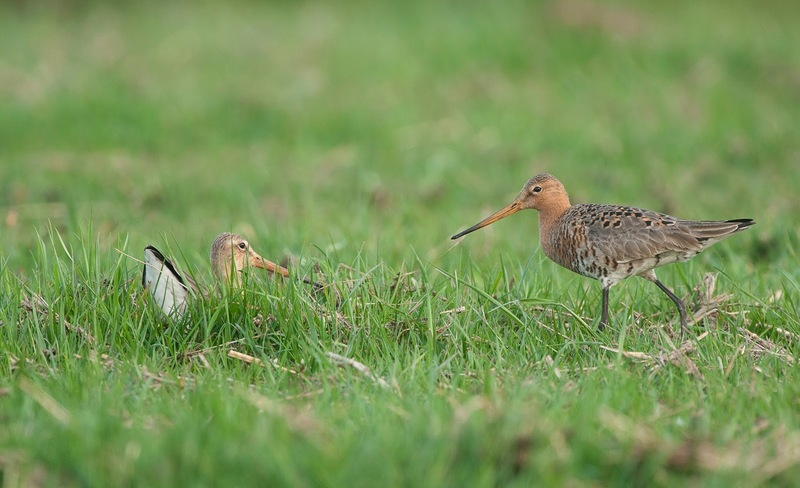 It's been a great season for Dutch Black-tailed Godwit heroine, Astrid Kant. We have reported on Astrid before and mention her in our talks. She is a shining example of what one person can achieve with a passion for a cause and a desire to act. Astrid is a glass half full person and says there is always reason to hope when it comes to conservation. We tend to agree, it just takes people to act. Black-tailed Godwit family. Photo: Astrid Kant. 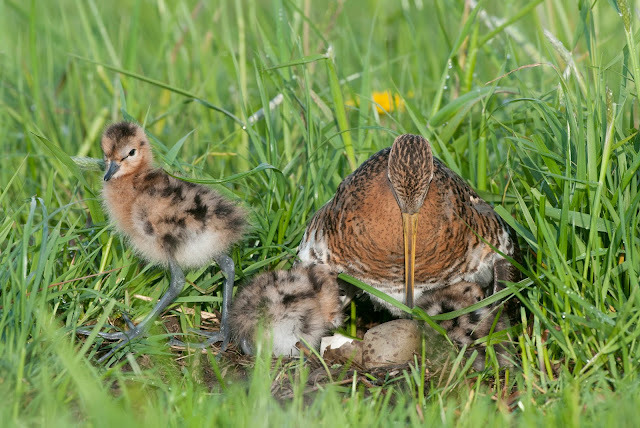 For approaching 30 years she has been protecting Black-tailed Godwit chicks from the mowing machines in the Dutch meadows. 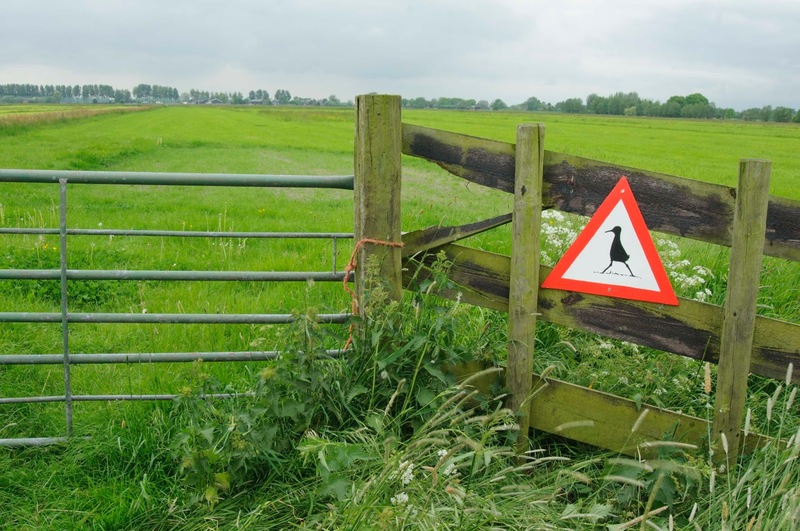 She has, over the years, won over around 30 farmers who co-operate with her, allowing her onto their land to mark the nests, which they then avoid when mowing. In addition the farmers create 'chick meadows' where the chicks can grow safely, these meadows are left untouched until June (the others are mowed in April). Astrid then tries to ring as many of the chicks as possible so that we can learn more about their habits, ecology and movements thus increasing knowledge which we can be brought to bear when considering how to protect them. This year has been a bumper year, Astrid has found an incredible 240 nests and managed to ring 41 big fledglings, a record even by her high standards. Astrid with one of the chicks she has ringed. She has also hand made these 'chicks crossing' signs and posted them where nests are close to public paths and they also serve as a kind of badge of honour for farmers as a reward for their co-operation. Gruttokuikens (godwit chicks) crossing. Photo: Astrid Kant. Closer to home, in the UK the Black-tailed Godwit has had a chequered past. It was once abundant and an important quarry species for hunters, apparently having a delicate flavour that surpassed all others, but it was not hunting that initially caused its rapid demise it was the draining of the fens. The fens stretched from Lincolnshire and Norfolk down to Cambridgeshire and covered a vast area. Gradually this was systematically drained to create prime farming land. As the habitat disappeared, then so did the birds and as the population diminished the hunting them became an accelerating factor in their decline. Alas, the species' decline coincided with a time when collecting was rife, every gentleman needed to have stuffed birds on his bureau. As the birds became scarcer their value in a collection grew until, as a rarity, they were much sought after. Like the Kentish Plover it was no good just having a Black-tailed Godwit in your collection, it had to be a scarce British Black-tailed Godwit. The last nest was plundered in 1885 and the person that took it was, in all probability, very proud of himself (its was mainly men that collected). Over fifty years later the birds returned as a nesting species but their return was not a sudden affair. There were several reports of suspected breeding attempts and in 1937 a pair produced eggs but no young were raised. Then in 1952 the first successful fledging was recorded and by 1961 there were 11 pairs. Since then the population has grown slowly, with a lack of collectors and some protection but there are still fewer than 60 pairs. Breeding pair of Black-taled Godwits. Photo: Astrid Kant. The population needed help and this year, for the first time 'headstarting' has been carried out to help enhance the population. Breeding success is the key to increasing, or even maintaining, a population and as ground nesting birds the Godwits' success rate is quite low; plenty of predators about to thwart their plans. Black-tailed Godwit chick. Photo: Elis Simpson - Wader Quest. Headstarting on the face of it seems to be counter-intuitive, taking the eggs from a nest of a wild bird to increase the wild population, but those birds may well go on to have a second nest to replace the one they lost and the chances of survival of the taken eggs are enormously higher. 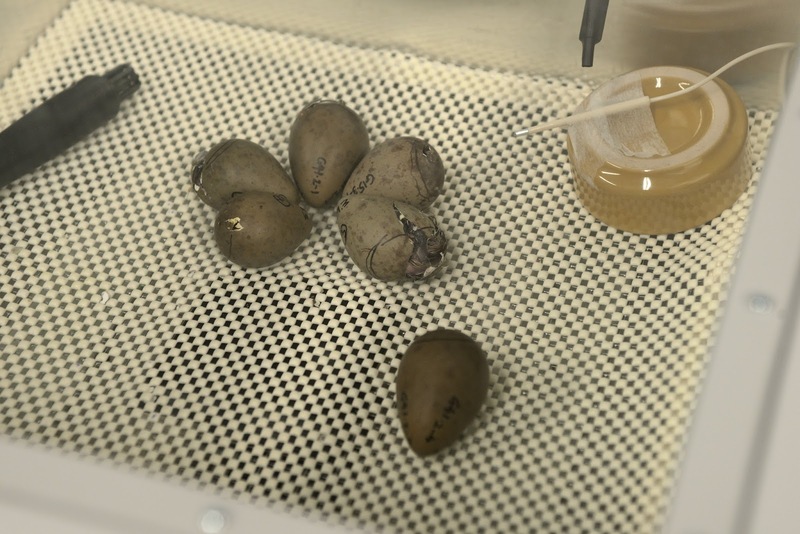 The eggs are hatched in an incubator and then the birds are kept in large pens as they grow protecting them from predators at the time when they are most vulnerable. When they are able to fly (have fledged) and able to escape mammalian predators, they are released to take their chances in the world. Black-tailed Godwit chicks hatching. Photo: Bob Ellis - WWT. The natural mechanism that allows for this sort of process is that the chicks are precocial meaning they are able to walk and feed for themselves within a very short time after emerging from the egg. The parents are there to protect them, they do not feed them at all, they are left to find their own food. This is why an abundance of invertebrates in the countryside is essential, they will have the automatic peck response if they see lots of critters moving around them. Black-tailed Godwit chick. Photo: Bob Ellis - WWT. The parents are not required for migration either, both the female (usually the first) then the male will abandon the chicks once they are fledged and, together with others hatched in the same season, they will find their own way to the wintering grounds. 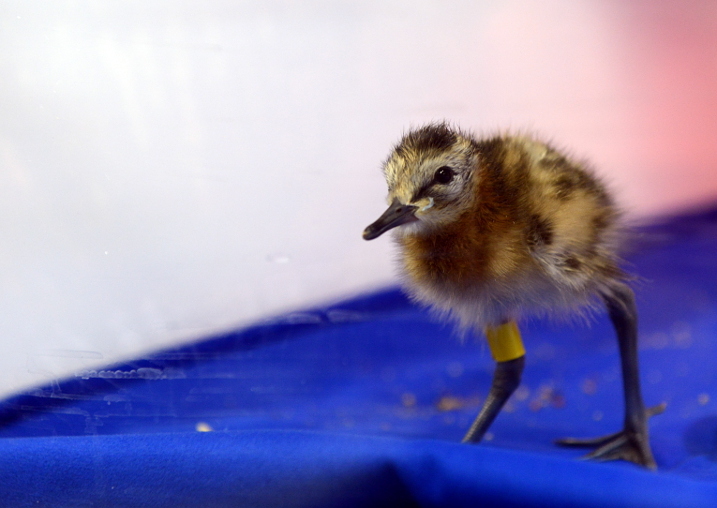 This year the WWT and RSPB have joined forces and have (when we visited) 26 chicks, doing well. They were recently moved to the large enclosure where they will be able to flex their wings to build strength before they are released, enhancing the local population. Wouldn't it be lovely if some day we would have 240 Black-tailed Godwits nests again in England. 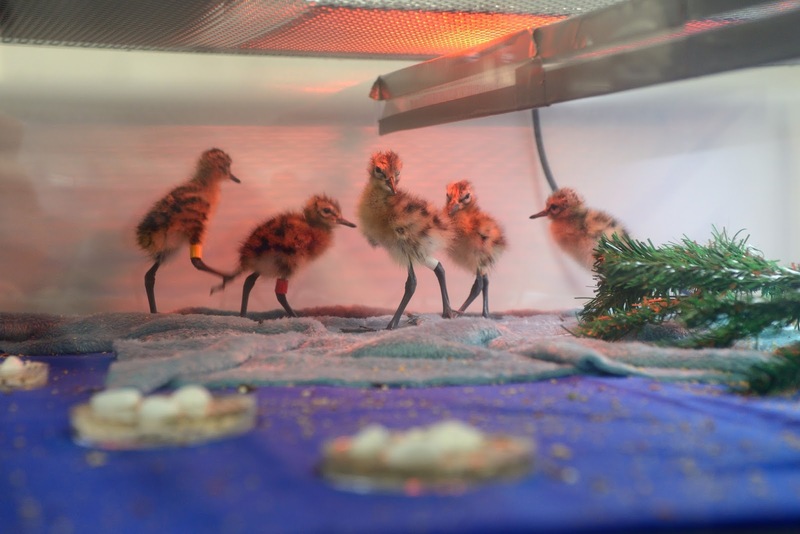 Godwit chicks in captivity. Photo: Bob Ellis - WWT. Look out for Black-tailed Godwits with colour rings and if you see any make a note of the combination and let us know and we'll pass it on, returning any information we get back to you, the observer. if you can get a photo, better still. 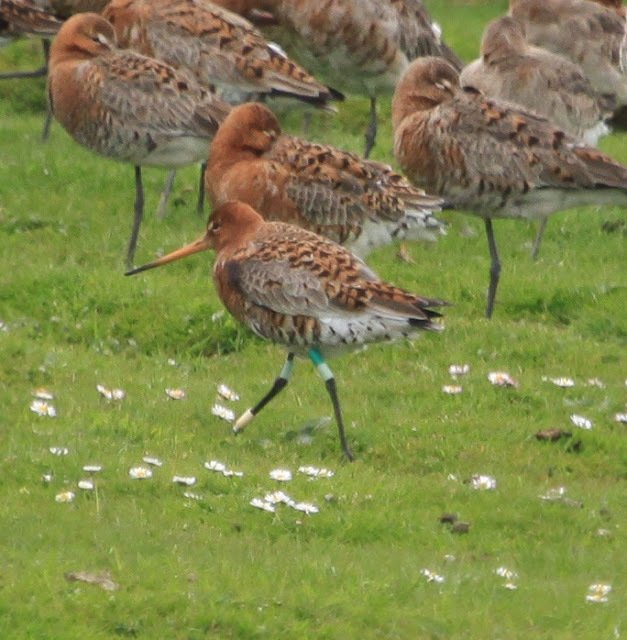 One of Astrid's Dutch ringed Black-tailed Godwit. Photo: Elis Simpson - Wader Quest. Some birds you see might be from Iceland, but these are still of interest as we need to find out more about them too. Colour ringed Icelandic Black-tailed Godwit. Photo: Elis Simpson - Wader Quest.